Mrs. Maxine Louise Powell of Cedar Springs, Michigan, age 90, passed away in the comfort of her home and into the arms of her Lord and Savior on Sunday, March 1, 2015. She was born to Howard and Emma (Fisk) Kilts in Solon Township, on Sunday, November 16, 1924 and had been a life-long resident of the area. As a homemaker, the most honorable profession, Maxine raised her family traditionally. She always enjoyed being near her family, providing and caring for them. Her wonderful homemade desserts, would surely keep them close. 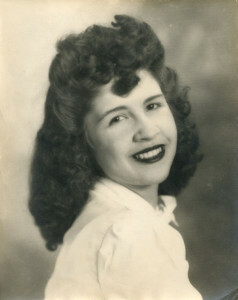 In her free time, she enjoyed reading country cooking and decorating magazines and was a dedicated Detroit Tigers fan. Maxine was a loving and devoted wife, wonderful mother, and the best grandmother anyone could ask for. Her faith was strong as well and important to her. She was a long-time member of Cedar Creek Church. Maxine is survived by her wonderful and beloved husband of sixty-nine years, Russell Powell; loving children Steve (Cindy) Powell, Linda (Chuck) Minker, Christine (Ross) Robinson, James (Cindy) Powell, David (Vicki) Powell, and Michael Powell; twenty-two grandchildren; twenty-five great grandchildren; five great-great grandchildren; brother Walter Kilts; sister Barbara Jean Wainright; sister-in-laws Betty and Lois Kilts; and numerous nieces and nephews. She was preceded in death by her parents; grandchildren Jamie and Jacob Powell; brothers Lavern and Norm Kilts; brother-in-law Jack Wainright; and sister-in-law Dorothy Kilts. A time of visitation was held from 2:00 until 4:00 p.m. and from 6:00 until 8:00 p.m. on Tuesday, March 3, 2015, at Pederson Funeral Home, 127 N. Monroe Street NE, Rockford, MI 49341. The funeral service for Maxine was celebrated at 2:00 p.m. on Wednesday, March 4, 2015, at Pederson Funeral Home. Rev. Richard Nichols will be officiating. Interment will be at Algoma Township Cemetery.